Ensure a quality, crafted piece that sets your kitchen, bath or patio apart from the rest with a custom concrete counter top or furniture item. Polished & sealed to provide years of protection, this natural material is versatile & affordable. Why not weave it into the design of your home or business today? 5M Construction applaudes themselves when it comes to creating an inviting shower. Care & attention to detail provide our customers with a beautiful finished product that you'll enjoy stepping into every day. The kitchen is often said to be the heart of the home & at 5M Construction, we lend it the attention it deserves. Browse our gallery to view some of our fantastic kitchen renovations- they're our specialty! From removing the old, to installing the new- hardwoods, ceramic tile or natural stone, 5M can complete your flooring projects with ease. 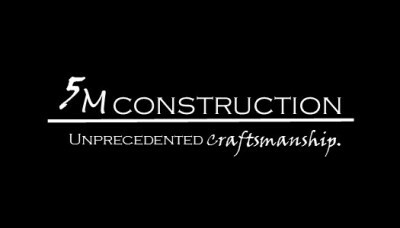 From decks to building walls, the 5M team can help you accomplish your home or business renovations smoothly. Another one of our specialties, the 5M team extends great care & craftsmanship in it's tile work & installation of bath materials. Browse our gallery to check out our beautiful baths!